The Friday before Pesach the students were called down to the gym for a special assembly about Pesach and making Aliyah to Israel. A few of our teachers after the school year are making Aliyah. Little did the students know that this video presentation was actually Color War 2013 breakout. 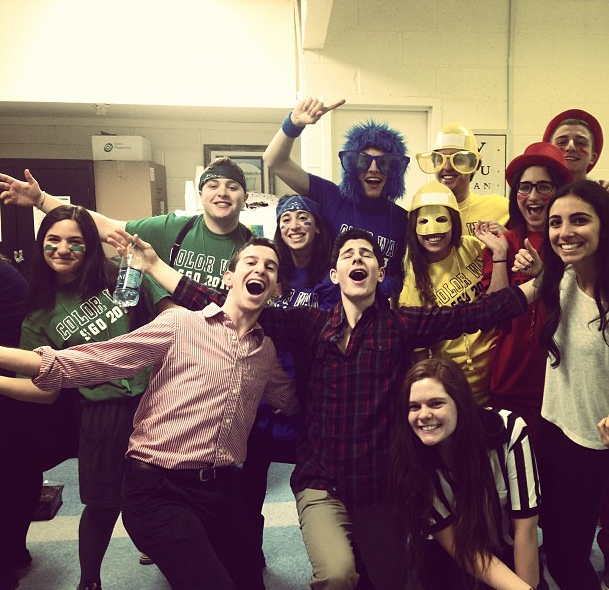 In the middle of the video Generals Norma Sutton, Edan Darmoni, Hannah Horowitz, Hymie Anteby, Jacob Lazorous, Adele Greenberg, Jacob Nawlo, and Sally Saban ran out screaming Color war breakout! The students cheered as SGO President Michelle Sabbagh explained the themes of this years color war. As the students found out what team they were on they proceeded to their team times where their generals introduced themselves and began the excitement of SGO Color War 2013/5773. This years themes were represented by the seasons of the year. The main theme was Progress and each season showed 4 steps of progress: Improvement, Independence, Resilience and Determination. As our world constantly advances there is one advancement that is often overlooked, which is the progress of our own selves. As they grow, trees use their seasons as their milestones of time and of progress, and as human beings so do we. Our jewish tradition provides us with improvement guideposts: the holidays. these markings of time lead us on our path of improvement and guide our development through every step. On Saturday night students involved themselves in the color war by going to designated houses for each team to help out with skits, videos, games, songs and more. On Sunday students packed the Beit Midrash to hear Rabbi Besser speak during Sunday Morning Learning. Afterwards students helped decorate the hallways with their teams theme which was spearheaded by the art generals. Students also took part with pesach packaging ran by Rabbi Besser. Every morning during breakfast students played musical chairs before they went to class. During the day on Monday students participated in Fun Games - for example college bowl and monopoly deal. On Tuesday students played Creative games - games having to do with the themes of color war. On Tuesday night about 60+ students stayed after school for the marathon which included balancing an egg on a spoon, solving a calculus problem and the final watermelon eating contest. On Wednesday the teams performed their boys dance and their songs and showed their commercials, skits, and banners that they have been working on since the breakout the past Friday. eKo Commission Cleans Up Beach!